Richa spends 14 days, exclusive of travel time, in a total of six cities. Each city she visits is in one of three countries—X, Y, or Z. Each of the three countries has many cities. Richa visits at least one city in each of the three countries. She spends at least two days in each city she visits. She spends only whole days in any city. If Richa spends exactly eight days in the cities of country X, then which one of the following CANNOT be true? She visits exactly two cities in country X. She visits exactly two cities in country Y. She visits exactly two cities in country Z. She visits more cities in country Y than in country Z. She visits more cities in country Z than in country Y. If Richa visits an equal number of cities in each of the countries, what is the greatest total number of days she can spend visiting cities in country X? If Richa spends three days in the cities of country Y and seven days in the cities of country Z, then which one of the following must be false? She visits more cities in country X than in country Y. She visits more cities in country Z than in country X. She visits exactly three cities in country Z. If the city of Nomo is in country X, and if Richa spends as many days as possible in Nomo and as few days as possible in each of the other cities that she visits, then which one of the following must be true? Richa cannot visit any other cities in country X.
Richa can visit four cities in country Y.
Richa can spend six days in Nomo. Richa cannot spend more than four days in country Z.
Richa can visit, at most, a total of four cities in countries Y and Z. If Richa visits a combined total of four cities in countries X and Y, what is the greatest total number of days she can spend visiting cities in country Y’? 1) How many cities are visited in each country? 2) How many days are spent in each city, and by extension, in each country? The Initial Setup: The main challenge here is the number element, but we do need to decide how to keep track of it all. At the start, we know that there are fourteen days spent in six cities, and (Rule 1) that the six cities are distributed among three countries. You can draw six dashes across the page and jot down a reminder of the total days, but that’s hardly progress. Best advice: Don’t draw anything yet. Wait and see where the rules lead. 1) Again, those six cities that Richa visits are each in one of three countries, X, Y, or Z. Since we are going to distribute cities among those countries, set up a column or list for each. 2) and 5) are loophole closers. Each country can have any number of cities—no limit on cities per country. And “a day in a city” means just that: Richa will not spend the morning in a country X city, for instance, and the afternoon in a country Y city. 3) Each country must be assigned at least one of the six cities. Draw a single dash under each country so as to remember the minimum per country. Make a mental note, too: Three cities are accounted for; the other three remain. 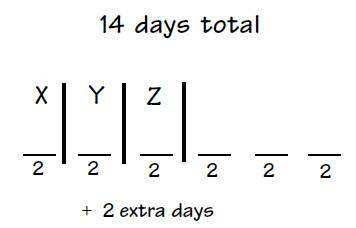 • She will spend 3 days in each of two cities, and two days each in the remaining four: (3 x 2) + (2 x 4) = 14. That’s it! These are the only two possible ways to distribute the fourteen days. —we see that both (C) and (E) could be true as well. The only choice that CANNOT be true is (A): Richa must visit exactly three or four cities in country X, not two, if she wishes to spend exactly eight days there. No matter what, the most Richa gets is six days in X, not eight as called for in the stem, confirming that (A) cannot be true under these circumstances. “An equal number of cities in each of the countries” is just the testmakers being coy: There are six cities to be visited in the three countries, so “an equal number” means exactly two cities per country. At least two days are spent in each city, so that makes four days minimum spent in each country. 4 x 3 = 12, meaning that at this point two of the 14 days have yet to be assigned, and there’s no reason why both can’t be spent in country X. Richa can spend up to six days in country X, choice (D). Take this question stem one step at a time. Richa spends exactly three days in country Y. Well, she has to spend at least two days in each city, so Richa can visit only one city in country Y. (Make sense? Two cities would require at least four days.) Jot that down: 3 days, 1 city in Y. Next: She spends seven days in country Z. Given that 2-day minimum for any city visit, Richa must visit exactly three cities in Z—one for 3 days, the other two for 2 apiece. (3 + 2 + 2 = 7.) No other way to distribute the 7 days of country Z. At this point the right answer is gettable, but let’s assume you didn’t stop to notice that (few would). We’re left with four days to be spent in country X, and two cities left to be accounted for (remember, we know there’s 1 city in Y and 3 in Z). Clearly she spends two days in each of country X’s two cities. Scan the choices against these deductions. Richa can’t visit exactly two cities in country Z—it has to be three. (D) must be false and is the answer. All of the other choices are true statements. One of the six cities now has a name: Nomo. Richa wants to spend as many days as possible in Nomo, which is in country X. Under Key Deductions, we saw that since Richa must spend at least two days in every city she visits, the most days she can spend in any one city is four. So we can infer that she spends four days in Nomo. Make Nomo the city already in X from our master sketch, and add the two extra days to give Nomo a total of 4. This means she’ll have to spend two days in each of the other five cities, to get to the total of 14. We were told that Nomo is in country X, so as long as Y and Z are assigned at least one city each, the other three remaining cities yet to be placed in our master sketch can go in of any of the three countries. Keeping all of this in mind, check the choices. (A) Nomo needn’t be the only city in country X. In fact, fully four of the six cities could be in X, leaving one each for Y and Z. (C) Richa will spend only four days in Nomo. As we’ve seen, four days is the maximum for any city, so six is impossible. (D) Sure she can; actually, Richa could spend up to eight days in country Z (4 days in X’s Nomo; 2 days in a single Y city; and 8 days spread throughout 4 Z cities). (E) Actually, Richa can visit at most five cities in Y and Z combined—as long as she spends the required four days in X’s Nomo. If Richa visits four cities in countries X and Y, then she must visit two cities in country Z (all 6 cities are now accounted for). She spends at least two days per city, so she spends at least four days in country Z. That leaves at most 10 days that she can spend in countries X and Y, and of these ten days, Richa must spend at least two days in one city in country X. This leaves a maximum of eight days that she can spend in country Y, choice (C).